Bowen therapy is a soft tissue remedial therapy that involves the therapist using fingers or thumbs to move over muscle, ligament, tendon and fascia in various parts of the body. This therapy can be effective to help relieve everyday stresses and revitalise the whole person. Appointments are not rushed and everyone is given the time and care they need to benefit from the treatment. The clinic surroundings are relaxing, calm and peaceful, giving an added bonus to the treatment. 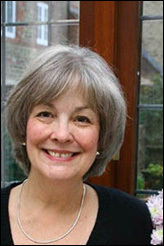 Janie has been in practice as a Bowen Technique practitioner since 1999. She is able to offer years of experience in the use of the Bowen Technique in application to a wide variety of conditions and complaints. You can check that Janie is a registered Bowen therapist with the Complementary & Natural Healthcare Council (CNHC) by searching the register at www.cnhc.org.uk. By choosing a Bowen therapist registered with the CNHC you can be confident that she is properly trained, qualified and insured. The Bowen Technique is not a substitute for medical treatment. The information contained in this website is given for your information and is not intended to replace guidance from your doctor or other health care professional who should be contacted for advice if you have any health concerns. Links to external websites are for interest only, and I cannot accept responsibility for the content of any website links.